With the deluge of films and general film watching over the [now seemingly distant] festive period, I had inspiration for a knitwear in films post. 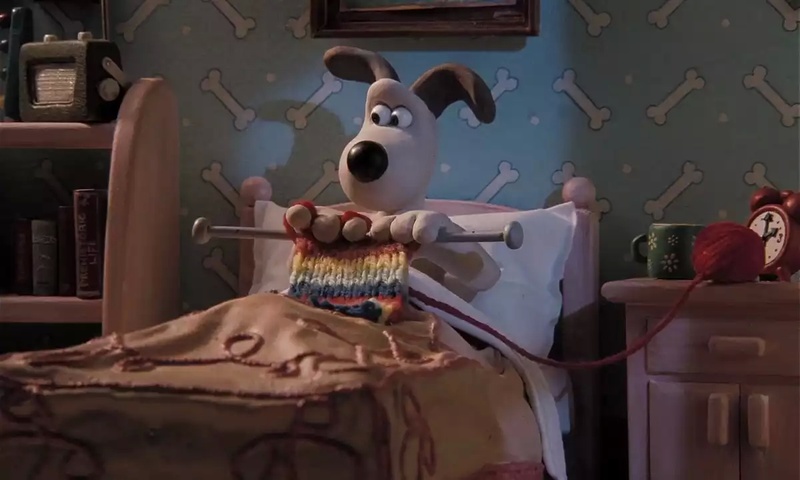 We’ve all been there Gromit – knitting in bed is a privilege, not a chore. And we couldn’t talk Wallace and Gromit without a nod to the “Knit-o-matic”. Classic Wallace. Rocking that cardigan at the bowling alley. The dude abides and so does his choice of knitwear. Steve Zissou from The Life Aquatic on trend with this block-colour beanie. That hat: fair isle made even more awesome in Home Alone. Twin Peaks is packed full of Lynch-esque style and there is covet-able knitwear in spades. This lovely jumper sported by Audrey is just one of many excellent examples. This knitting ends up in the puddle at the end. Much sadness, but an excellent choice of knitwear for a chilly flight in deepest winter. If only all school uniforms featured such fetching knitwear. It’s nice to have variety, and these arm warmers sported by Kate Winslet’s character in Eternal Sunshine of the Spotless Mind give us our first knitwear in the “gloves” category. An awkward knitting moment in anyone’s book – Bridget and Darcy looking delightfully festive. Did I miss any out? I am sure there’s far more filmic knitwear out there just waiting to be discovered – let me know any you think of in the comments. This entry was posted on 30/01/2015 by thisischarlie in Crafty fun, knitted hats, Knitting and tagged Bridget Jones jumpers, famous knitting, gromit knitting, Harry Potter scarf, Hogwarts scarf, Holly Golightly knitter, Home Alone bobble hat, Knitting in films, knitwear, The Big Lebowski, The Dude's cardigan, The Snowman scarves, Twin Peaks knitwear, Wallace and Gromit.